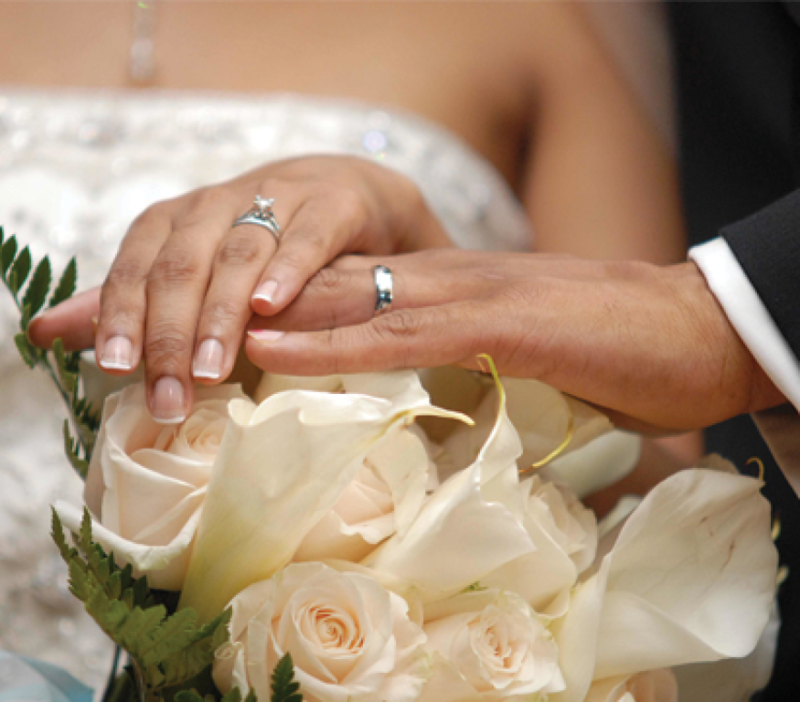 Theological Orientation: The Sacrament of marriage is a contract implying total and permanent commitment between a man and a woman; it is a covenant based on fruitful love; it is a sacrament bringing the ongoing power of the Holy Spirit to the relationship and signifying the union of Christ with the Church. The commitment of marriage implies mutual support and affection and total faithfulness to one another in body and spirit. As the couple grows together through life, their love will be directed toward fruitfulness, family, and hospitality toward others. It is primarily in the family, the "domestic church", that faith is expressed and nourished. Marriage rooted in the grace of baptism grows strong in the light of the family's daily living of the Christian life. Our parish community supports the role of the family by being a worshiping, believing, serving community and by providing ongoing spiritual formation for all. Weddings are generally celebrated on Saturdays at 10:00 am, 12:00 Noon, and 2:00 and 6:30 pm. Weddings are not celebrated during Lent, except in emergencies. Weddings can be celebrated in the Daily Mass chapel or in the Church. The couple generally prepares for marriage in the parish where at least one of them is a registered, participating member. The couple contacts the Parish Office at least four to six months before the proposed date of the marriage. For further information, Karin Alcock, 321-773-2783, x134, kalcock@hnj.org. If one or other of the couple has been previously married, and if an annulment is needed, the annulment process will be completed before marriage preparation begins. At the couple's first appointment, elements of the preparation process will be explained. These include: the FOCCUS assessment; the Engaged Encounter or Pre-Cana seminar/retreat; meeting with the priest or deacon who will preside at your wedding; planning the liturgy; and the required paper work, including a recent copy of each one's Baptismal certificate (if applicable). Photographer/Videographer: Pictures without flash and in moderation are permitted in the church during the ceremony. All photographers must remain hidden from view until the ceremony has ended. At NO TIME may picture taking interfere with the ceremony. Video cameras must remain stationary, and tripods will be restricted. Posed pictures may be taken for up to 30 minutes following the ceremony, depending on the time and date of the wedding. Prior arrangements must be made with the wedding coordinator. More information from the Diocese of Orlando.